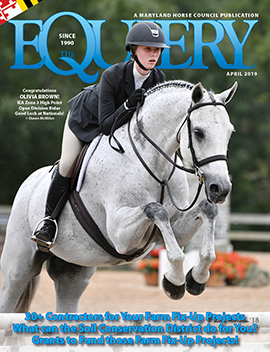 According to the Florida Department of Agriculture and Consumer Services’ Division of Animal Industry, seven cases of Equine Herpesvirus type 1 (EHV-1) had been confirmed by Dec. 19, 2006 in horses at Wellington and Ocala, popular destinations for equestrians competing on that state’s winter circuits. Many Marylanders planning to ship horses worth as much as six figures to that area have reportedly put their plans on hold. The disease, which struck Maryland early last year, can be deadly in its neurological form. By press time, three horses in Florida had died and others had shown symptoms consistent with EHV-1, according to Liz Compton, the department’s public information director. All confirmed cases are under quarantine, with a suspected case in Jupiter also under quarantine and awaiting lab results. The outbreak prompted the cancellation of the American Grandprix Association National Championships and the Christmas Festival Horse Show. The region’s Thoroughbred racetracks and training centers are also said to be monitoring the situation closely. The first reported case was one of 15 horses imported from Europe through the United States Department of Agriculture’s New York Animal Import Center at Newburgh, New York. Five of the European imports were shipped from the import center to Florida. En route to its destination, the vehicle shipping these horses also picked up three horses in Huntington, New York and one horse in Darlington, Maryland. When the vehicle arrived in Wellington on Nov. 29, one of the horses from the import station was reportedly ill. According to Compton, that horse is now recovering, but two other horses who were stabled with the sick horse at the original Wellington facility (J N and Company) became ill and died. A lab test on one of those horses confirmed EHV-1. The Maryland horse was shipped to another Wellington location, Southfields Training Facility, and died two days later after being treated for pleuro pneumonia. While no lab test was done, because of its exposure to EHV-1, the Southfields facility voluntarily restricted all movement of horses. On Dec. 19, the Florida Department of Agriculture reported that a horse had tested positive for EHV-1 at the Palm Beach Equine Sports Complex, which is part of the Southfields facility. A second suspected case there is reportedly awaiting lab test results. “We do not really think, since it died within two days after arrival, that [the Maryland horse] is the source [of the virus], but since it was never tested, there will never be a definitive answer,” said Compton. On Dec. 20, the Maryland Jockey Club announced that effective immediately, no horses shipping in from Florida would be allowed to enter any Maryland Jockey Club facility. Horsemen were also reminded that pre-existing entry health requirements remained in effect. These include a certificate of veterinary inspection from a licensed veterinarian listing the horse’s EHV-1 vaccination date, proof of negative Coggins, and the horse’s temperature.